Eleven course / group rooms seating from 2 to 600 people. Enquiries and booking: kurs@parkvoss.no or call (+47) 56 53 10 12 / 04 / 00. 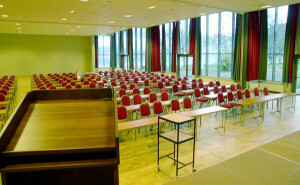 Vossasalen, the largest conference room at Park Hotel Vossevangen, accommodates up to 600 people. Voss finally has its own large venue with a stage for lectures, conferences, concerts, theatre performances and exhibitions. Vossasalen can easily be divided into three smaller rooms so that smaller groups can also enjoy it, without feeling that they are too few to justify it. 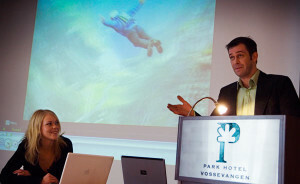 A venue like Vossasalen now makes Voss and Park Hotel the perfect place for courses and conferences. We have the pleasant, informal atmosphere that organisers look for, excellent service and organisation, great food and drink, exciting cultural and natural experiences and a great variety of activities on offer all year round. Our course and conference facilities total 1,400 square metres. You step out of Vossasalen conference room into Vossajuvet, a large and airy mingling area with a bar and fantastic views of Vangsvatnet lake and the surrounding mountains. Vossajuvet is also suitable for exhibitions and trade fairs. Being able to go up to the viewing bridge in Vossajuvet or to walk straight out of the door and down to Vangsvatnet lake during breaks creates a truly unique atmosphere. As a course guest at Park Hotel Vossevangen, you will feel you are being well looked after. Here, you can relax, enjoy yourself and feel that everything has been done to facilitate maximum concentration as well as maximum relaxation. There is free wireless internet throughout the hotel.